Aniston has yet to even acknowledge that she’s maaaaarried and thus free from the shackles of eternal loneliness. More pressing, though, she has yet to reveal what her wedding dress looked like, which we need to know. Two dresses have since come forward. 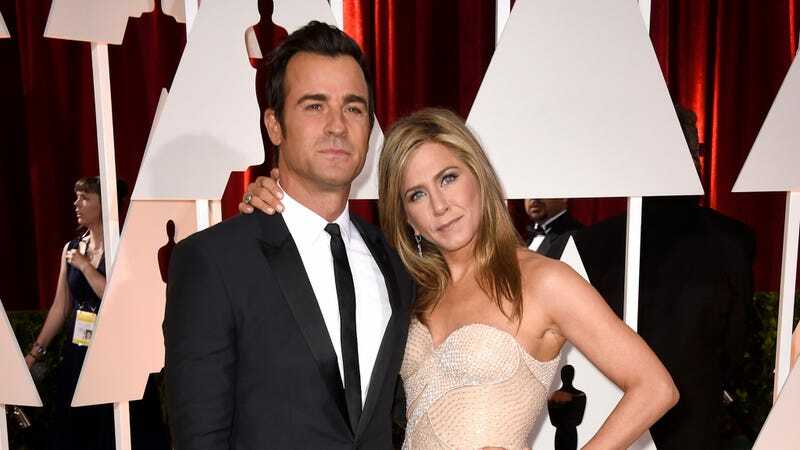 First, on Sunday, a Facebook page listed as “Jennifer Aniston” (it’s since changed its name to “Jennifer Aniston Fans”) posted a photo of a woman in a wedding dress, with the caption: “You have my whole heart for my whole life #WeddingDress.” People actually believed this woman to be Jennifer Aniston. A second potential wedding dress candidate appeared on an old episode of Say Yes to the Dress. Watch the video below. In a blink-and-you’ll-miss-it moment from a Say Yes to the Dress episode that aired this April, a fittings specialist from famed Manhattan boutique Kleinfeld Bridal says an $8,400 Mark Zunino gown is one she handpicked for Jen to wear on her big day. Now we know she could just mean the look was one of many design options sent to Jennifer as a congratulatory gesture (in fact, stylists from Kleinfeld were reportedly asked to submit dress ideas for Jennifer that would appear in a magazine feature—and the Zunino confection was one of them)—but some people on the Internet think they’ve cracked the Aniston bridal gown code. Seriously, will we ever know?